Louie Bretaña is a graduate of Elam School of Fine Arts and the College of Fine Arts, University of the Philippines. 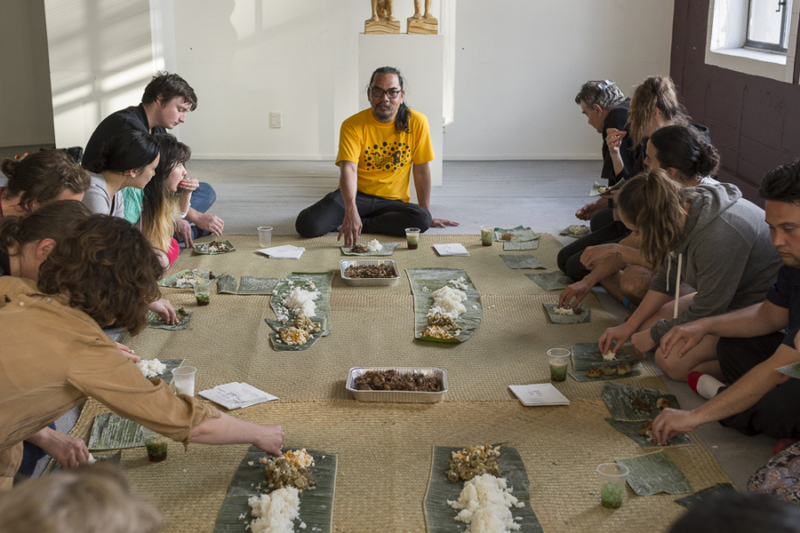 His work actively challenges Euro-western colonial histories through relational practices, encouraging a respectful engagement with culture via conversation and food. 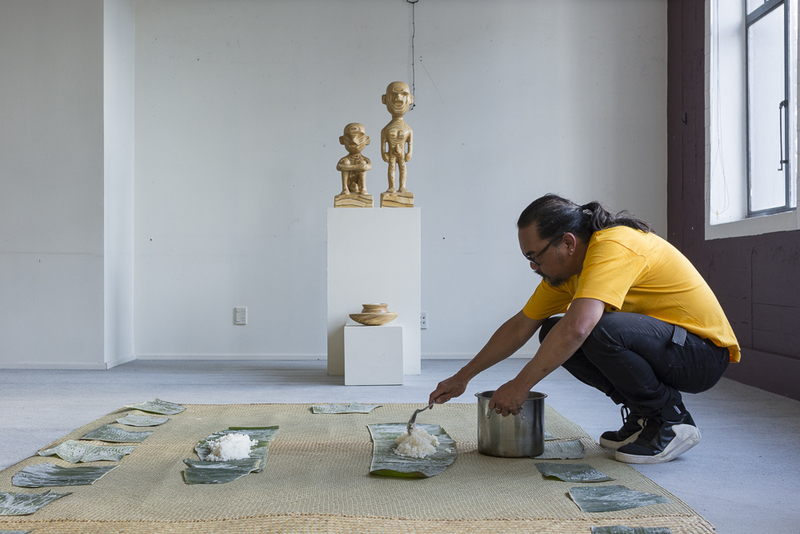 Last year, Louie presented Eat My Rice at a number of locations in Auckland and Wellington, including at Performance Art Week Aotearoa (PAWA). Amy Weng spoke to the artist about his practice, the reclamation of indigenous practices, and some of the tastiest parts of the animal. Amy Weng: You mentioned that you wanted to travel as part of your research. Can you tell me about that? Louie Bretaña: I wanted to visit the Field Museum in Chicago because they have a collection of precolonial Filipino artefacts. There’s also a book at the University of Indiana, the Boxer Codex, which is the oldest, visual recording of a precolonial encounter with native Filipinos. I want to be able to look at these and find inspiration for my next body of work. AW: Why are these artefacts housed in the United States? LB: Precolonial Philippines was rich in gold. In fact, one of the Spanish documentarians of the time noted how most of the native people were all decked in fine jewellery. And that was one of the main reasons the Spanish wanted to colonise the country. Oh, they’ll make all these excuses of spreading the Catholic faith and bringing civilisation to the foreign savages but at its core, colonisation was driven purely by economics and by the intention of enriching the empire. Most of our precolonial artefacts were made of gold and precious metals. After these items were transported out of the country, most of them were destroyed or reshaped. Very rarely are there things that survived, and many of them are in foreign museums. Only a few of these culturally valuable objects remain in the Phillipines. And I honestly cannot understand why a foreign museum would want to retain these objects other than it reinforcing supremacist thinking through the ownership and exhibition of these objects with no cultural significance to their own people, as if they keep it as proof of a once savage land they were able to conquer. AW: How do these artefacts relate to your current work? LB: It all goes back to my own personal journey of decolonisation. It’s pretty tough given that I grew up in a society that is strongly Catholic and has an American educational system, both remnants of our colonial history. Colonialism is so deeply embedded into our society that we grow up with an internalised colonial mentality. We grow up thinking everything white is good, all things brown are inferior. Why do you think we’re one of the biggest markets for skin whitening products? If I truly want to decolonise, I need to shake all of this off, to look at my teen years with criticality. That’s where I think my practice is leading – more research into the original Filipino identity – everything from the culture itself, the aesthetic and the narratives and mythologies – and removing all the influences from different colonial periods. I even want to look into the role of the artist at that time. It’s only in the western construct that artists are people that create objects for the sole purpose of appreciating its intrinsic beauty. Most indigenous cultures look at artists as artisan, people who make objects that serve a purpose, whether spiritual, social, or functional. So who knows, I might end up mixing a bit of contemporary materials with a bit of magic and hoodoo. 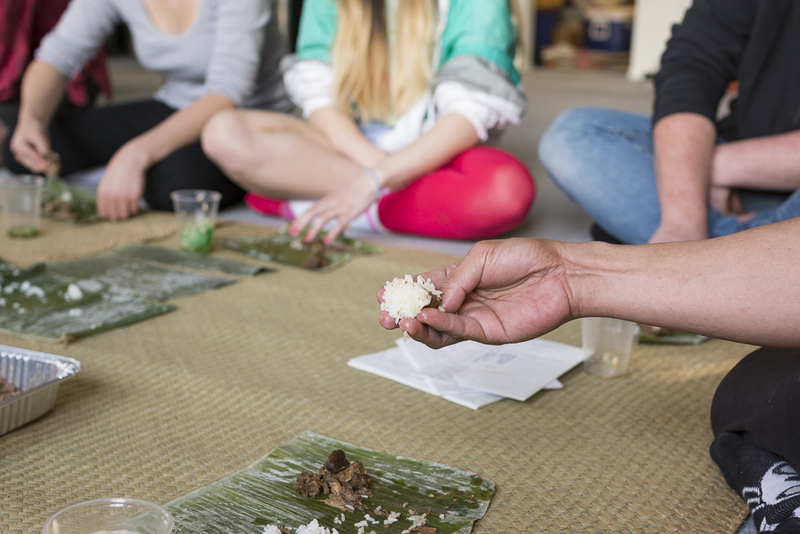 AW: I remember the project that you did with us at RM Gallery, Eat My Rice, where you served traditional Filipino food on banana leaves to be eaten with the hand. And you had sculptures of the rice gods there watching over us. Is this related to that research? LB: Pretty much. The rice gods were my first attempt at exploring precolonial narratives and mythologies. The sculptures were inspired by the bulul, the ancestral guardians of the rice fields from the Ifugao tribe of the northern Philippines. They are believed to house the spirit of the ancestors and are imbued with magical properties. I just though that if Catholicism didn’t come in, these sculptures would be representative of our precolonial deities instead. So I dedicated the sculptures to Lakambakod, the precolonial guardian of the rice fields. I even made pots and bowls as companion pieces to hold offerings to the god. And these have become part of the relational experience, to give thanks to the god as part of immersing oneself into another person’s culture. It’s one of the things I was looking into. Some of the research that I did previously was looking into amulets that were believed to hold magical powers and blessings. It’s almost a shamanic role that the precolonial artisan played in their belief in being able to imbue power to objects. AW: You had a show in Wellington recently as well. LB: Yes, that was a solo performance during the inaugural festival of Performance Art Week Aotearoa. It was my first time to see the work outside of the academic setting of Auckland and out in the open. I was a tad nervous but it went well. That’s why I’m also thinking of continuing with Eat My Rice and maybe expanding it into a collaborative platform for other contemporary artists of colour to discuss colonial and racial power dynamics. We had one in the middle of last year at Lowtide Studios at St. Kevin’s Arcade. That was a collaborative work with Nadine Paredes, Divyaa Kumar and Wai Ching Chan. Wai Ching’s work also had a strong narrative on the symbolisms attached to food in Chinese culture. In the RM Gallery show, Divyaa spoke about the reclamation of tea and chai back to its Indian and Chinese origins. I thought that was very strong work. AW: The Opium Wars were fought, essentially, over tea and opium. The British wanted tea from China, and China wouldn’t give it to them so they basically stole it and turned British-occupied India into a tea plantation. It’s insane to think about this nowadays. LB: And to think that nowadays tea is synonymous with British culture but it didn’t come from them. Same with potatoes. Potatoes are considered so Euro-American when it was native Americans who first cultivated potatoes. And permaculture – it’s a practice that if you think about it is a rebranding of indigenous farming techniques. What we know now isn’t what it used to be. That’s one of the things I want to show with my work, with projects like Eat My Rice. It’s the notion of respectful intercultural engagement. We have to be able to look at another person’s culture and not see what’s wrong with it, but learn from it and give them credit for it as well. Rebranding and appropriating something from another culture is a disservice to that culture. Particularly if it is a Euro-Western appropriation of a practice or belief. You’re contributing to the erosion of the indigenous culture if you do not acknowledge what you have appropriated. That’s not very respectful. One thing that I like about the context of New Zealand is there is a certain openness. Of all the place I could be in, New Zealand would be one of the ideal places. AW: What about the Phillipines? Do you see there being a revitalisation of traditional practices there? LB: I hate to say it but I think there is still a very strong colonial mindset. You can’t get rid of 400 years of internalised racism and socially embedded colonial thinking that easily. We still judge everything by western standards. If you can speak English well and demonstrate a good knowledge of western culture, then you’re good. You’re a coconut, brown on the outside and white on the inside, but your friends will think you’re cool. But there is also an awakening amongst Filipinos themselves – a renewed appreciation for our original culture, our original peoples. Rarely do you see people from our original tribes finding themselves in the limelight. Whang-od Oggay has been recognised as one of the last mambabatok and the last proponents of a dying artform. But that being recognised, the artform in itself is hopefully being revived, maybe not in its original context but in an evolved one. AW: I was thinking about your performance of Eat My Rice and how you said it was the Spanish that came along and decided that eating with your hands was a ‘savage’ act, that the very basic function of eating can be colonised – that was really powerful. But in experiencing the work it made me think that this was an incredible tactile way of eating, and actually I didn’t feel that I had the grace to eat with my fingers. I felt very clumsy. How did you arrive at food as your medium? LB: Food is a person’s investment of time, emotions and memories. That’s one of the things I appreciate about food. Food is a story of a person as much as it is about a country, a culture, a people. But I stumbled across food in my practice, it was not something I intended. In one of my critiques at Elam I decided to bring food in and share it with my classmates and it kind of jumped off from there. People were very supportive of me using food and it was something I could relate to – that all Filipinos can relate to. We just love food! I think the bigger part of it was that I was able to find a means of getting my message across about racial dynamics. To me, that was a pleasant surprise. The food itself and the context of sharing was a good thing and people became very receptive to the idea of respectful intercultural exchange. Of course it helps that they had just been fed! AW: It’s a bit like how you might have a cup of tea or a biscuit after a powhiri, to become noa, to become ordinary to one another. LB: Yeah, I agree absolutely. It’s something to do with the role of food transcending nourishment. To me the hangi should be elevated as a practice. The sheer effort that goes into a hangi should be appreciated. I think it transcends the act of sustenance. 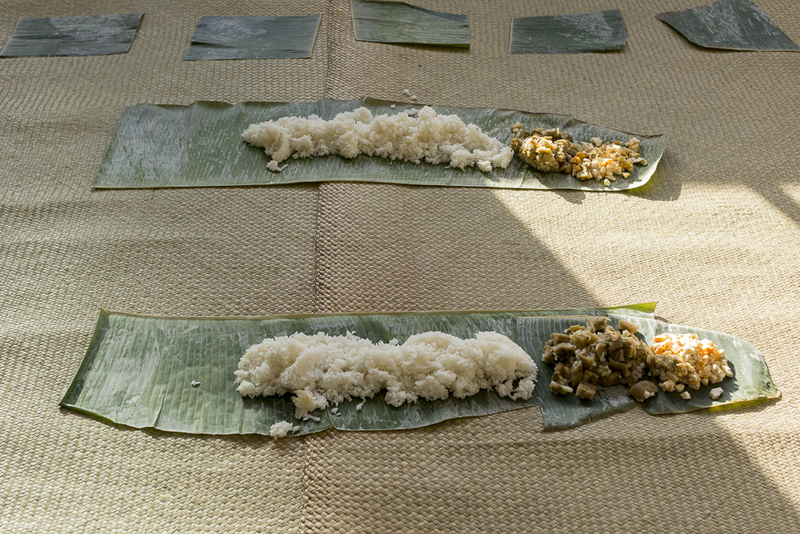 Everything that gave its life for the meal is accorded respect, and it’s all communal. AW: Is that why you use gizzards? Because you wanted to respect all of the animal? AW: But I knew it was. LB: I was so tempted to add other things as well, like intestines. I love intestines. AW: Yeah, I didn’t realise how much I loved intestines until I went to Hong Kong. You get intestines fried on a stick. It’s all crunchy. I can’t read much Chinese but I can speak Cantonese, so whenever I go travelling I just look at where everyone else is going. I lined up at this place near Temple Street and saw that it was pork but couldn’t read anything else. I got to the front and there were all these vats of boiling stuff, so I asked the lady next to me what was good and she said dai cheong – pork intestines – so I said, yeah I’ll take one of those. LB: People who have never eaten intestines, they are missing a lot. AW: I think it tastes like chicken skin. LB: But a lot richer. A lot creamier. In the Phillipines we have a dish called kare-kare. It’s a mix of oxtail, sometimes ox tripe, intestines stewed in peanut sauce and it’s served with shrimp paste, as well as bok choy, eggplant and string beans. It’s a very good mix – it’s that flavour profile of the Philippines that mixes that nutty, sweet sauce with the sharp salty taste of shrimp paste then the sweetness you get with the blanched vegetables and the savouriness of the meat and the fat. That’s one thing I notice with the intestines as well. When you eat it there is so much fat, it’s a burst of happiness in your mouth. AW: I can’t stand lung though. LB: We have a dish in the Phillipines but the lungs have been minced and cooked. It’s sometimes served on a hotplate so it crunches up. The bitterness is part of the taste that works with it. AW: I’ve only know of Turo-Turo here, but what’s the best Filipino restaurant in Auckland in your opinion? LB: You know, turo-turo means point-point. Because in the Philippines, turo-turo are those places where all the food is in front of you and you choose by pointing. They’re one of earlier quintessential Filipino foods here in New Zealand. The other place that is surprisingly good is the one on K Rd, Ensalada. And the one in Elliots Stables, Home Cooked. It is very good. They have this tamarind soup. In the Phillipines, this soup is supposed to be so sour that your face would crumple up as you cringe. The one you have here is sour but it’s not quite as strong as I’m used to. I think the taste is just a little bit adapted to the New Zealand palette but it’s close to home. Most foods that are brought in become adjusted to suit the local palette and availability of ingredients. You even have pakeha chefs proclaiming themselves as experts of Asian cuisine! Yep, food can get white-washed. But ask any immigrant and they’ll tell you it’s not quite the same as what they had back home. The only way you can have a real taste of the cuisine and the culture of another land is to respectfully engage with the full flavour and culture on its own terms. And if you think your foreign taste buds would know better, well… Eat Me.